The series follows a group of gifted students in the Individualized Honors Program (IHP) at the fictional Monroe High School (later Millard Fillmore High School) in Manhattan, and their history teacher Charlie Moore (Howard Hesseman). The program was ostensibly a vehicle for Hesseman, best known for his role as radio DJ Dr. Johnny Fever on the sitcom WKRP in Cincinnati (1978–1982). Hesseman left Head of the Class in 1990 and was replaced by Scottish personality Billy Connolly (in his first major American production) as teacher Billy MacGregor for the final season. After the series ended, Connolly appeared in a short-lived spin-off titled Billy. Head of the Class deals with an entire classroom of academically gifted high school students. The IHP students comprised a diverse range of personalities, ethnicities, and academic specialities. In the first three years of the show, the IHP class had ten students. Arvid Engen (Dan Frischman) was a skinny, bespectacled nerd, mathematics expert and budding scientist. Arvid's best friend was the overweight, wisecracking cynic Dennis Blunden (Dan Schneider), a computer whiz who more often than not had a knack for getting the socially-inept Arvid involved in various schemes. Alan Pinkard (Tony O'Dell) was an ultra-conservative preppy and egotist; his area of expertise was political science and he was a devout fan of Ronald Reagan. Alan competed for the highest grades in the class with Darlene Merriman (Robin Givens), a spoiled rich girl who was probably even more self-centered than Alan. Both Alan and Darlene held the ambition of being named class valedictorian. Sarah Nevins (Kimberly Russell) did not have any one particular area of expertise; she was the most down-to-earth of the IHP class, and was once cited as having the lowest G.P.A. Maria Borges (Leslie Bega) was very passionate about getting A's (going as far as grounding herself in the pilot episode for getting a 'B'), and Jawaharlal Choudhury (Jory Husain aka Joher Coleman) was an exchange student from India. Eleven-year-old Janice Lazarotto (Tannis Vallely), despite her young age, was in high school and the IHP class because of her advanced intellect. Arts student Simone Foster (Khrystyne Haje) was a quiet, sensitive redhead with a particular fondness for poetry. A notable development in the show was the relationship between Simone and Eric Mardian (Brian Robbins), an aspiring writer and, outwardly, the most unlikely member of the IHP - Eric wore black leather, drove a motorcycle, acted tough and ostensibly disliked anything academic (to Dr. Samuels's delight, he was the only one in the class not on the academic team, although he would never leave the IHP). Eric hit constantly on Simone (on whom he had a crush) and the two eventually had an on-again-off-again romance. There was some turnover in the cast in seasons four and five. Janice left for Harvard, Maria went to Performing Arts High School, and Jawarhalal moved to California. New students included Aristotle McKenzie (De'voreaux White), described by Dennis as "this reject from Do the Right Thing" for his dreadlocks, Vicky Amory (Lara Piper), a new-ager interested in quantum physics and skin-revealing clothing, and Alex Torres (Michael DeLorenzo), who had transferred from parochial school. T.J. Jones (Rain Pryor) and Jasper Kwan (Jonathan Ke Quan), who had appeared as potential IHP members in earlier seasons, were eventually added to the program and the cast. Appearing as regulars throughout all five seasons were school staff members Dr. Harold Samuels (William G. Schilling) and Bernadette Meara (Jeannetta Arnette). Dr. Samuels was the blustery, overweight principal of the school. His attitude towards the IHP students was one of ambivalence: on the one hand, Dr. Samuels distrusted the kids (and had a particularly antagonistic relationship with Dennis, and tried to avoid Eric), but at the same time he was proud of their achievements and valued the prestige they brought to the school. Ms. Meara was Dr. Samuels’ level-headed administrative assistant. There was some romantic tension between her and Charlie, although this ultimately came to nothing, and later had a romantic 'friendship' with Billy. In the series, the students often faced off against the rival Bronx High School of Science. Also, in every season, the IHP students produced the school musical. Musicals staged by the students included Grease, Little Shop of Horrors, and Hair. A number of someday-famous actors made appearances on the show, including Brad Pitt. Out-of-work actor Charlie Moore began the first season as a substitute teacher, but warmed to the IHP class immediately, making it his mission to get them to think rather than merely to know. Although they are gifted academically, the IHP students had plenty of problems in their personal lives, and Mr. Moore not only is there to listen, he shows an unswerving ability to get the students to solve their own problems while making it seem like they came up with the answers on their own. By Episode Six, the class's original teacher (Roscoe Lee Browne) had retired, making Mr. Moore their full-time teacher. Throughout the first season, Mr. Moore attempted to get the class involved in more than just their studies, encouraging them to play volleyball and make a music video for the school's time capsule (this marks the first foray into the fondness of Head of the Class for musical production numbers). At the same time, the class brought Mr. Moore into the present, acclimating him to the importance of personal computers. Near the end of the season, the IHP faces their Russian counterparts in an academic tournament, foreshadowing their famous trip to Moscow in season three. Season two began involving the IHP in the school as a whole, with Mr. Moore involving the class in the school literary journal and encouraging a lampoon of the school newspaper. In 1988, Head of the Class broke new ground as it became the first American sitcom to be filmed in the Soviet Union and was entirely filmed in Moscow. The IHP is invited to come to the country for a rematch of the academic meet that happened in season one, which ended in a tie. The class has a lot of experiences while in Moscow: Dennis and Arvid take an interest in two beautiful women, until they realize they might be KGB spies; Eric meets up with his relatives in what is a very positive experience for him; capitalist Alan has an argument with a die-hard socialist in a store (who is also on the opposing Russian academic team); Sarah and Darlene decide to record the sights and sounds of Moscow; Simone goes to put flowers on a poet's grave and meets up with a charming Russian musician; Dr. Samuels believes that his hotel room is bugged, but ends up making a fool of himself; and Charlie has a brief romance with a schoolteacher. The IHP eventually wins the meet and the respect of the Russian team. The episode concludes with both teams attending a concert in Gorky Park swaying to the song "Far Away Lands" (written and performed by American David Pomeranz and Russian rock star Sasha Malinin). The fourth season saw some significant changes to the cast of characters- Maria, Jawaharlal and Janice left (Maria went to a performing arts school, Jawarhalal moved to California, and Janice went to college). Several new characters took their place: Alex Torres (Michael DeLorenzo) was a Hispanic athletics student, somewhat stereotypically portrayed as having an eye for the ladies. Although Alex seemed attracted to Darlene particularly, both he and Eric competed for the affections of another new IHP student, the blonde hippie Viki Amory (Lara Piper). Another new character was aspiring filmmaker Aristotle McKenzie (De'voreaux White). T.J. Jones (Rain Pryor), a recurring character since the third season, joined the IHP in the fourth season (a remedial student with a streetwise attitude, T.J. was found to be smart enough to join the IHP). The students' final year of high school was split over seasons four and five. Howard Hesseman left the show after the fourth season. In the first episode of season five, Scottish teacher Billy MacGregor (Billy Connolly) arrived to replace the departed Charlie Moore (in the first episode of the season, it is explained to the dismayed IHP students that Mr. Moore's acting career finally took off). Despite initial uncertainty and some hostility from the students, Billy proved to be a successful replacement for Charlie. He insisted that the students refer to him by his first name, and although he was more rousing and less laid-back than his predecessor, he proved to be just as wise and caring (Billy also had a habit of boisterously greeting his class every morning with the phrase, "good morning, geniuses", and facetiously barking to his students to, "get out of here", when the bell rang at the end of the class. He also taught his class in a manner more akin to a stand-up comedian than a teacher). Many episodes from this season focused on Billy having to adapt to living in America, and his attempts to romance Ms. Meara. Other aspects of Billy were his dislike of an outdated French textbook, which actually prompted one student to take a spur-of-the-moment jaunt to Paris, and his encouragement to the male students that the best way to get girls was to be themselves. Also, the character of Jasper Quong (Jonathan Ke Quan) was added to the IHP class. The season (and the program itself) concluded with the IHP students graduating from high school. Janice Lazarotto (from seasons one–three) returned for a guest appearance in the finale, in which T.J. is named class valedictorian and the school is closed down and demolished. One major novelization was released, with the plotlines based on 6 episodes of the show. The book makes all the chapters flow together as one story, even though they didn't happen one right after the other on the show. It was written by Susan Beth Pfeffer and released in December 1989 by Bantam Books. The book is 120 pages long, with six chapters and each chapter is based on an episode. All copyrights belong to Warner Bros. The novelization erroneously credits "First Day" as having been made in 1988 rather than 1986. A year after Head of the Class left the air, Billy Connolly reprised the role of Billy MacGregor for a short-lived spin-off series, Billy. In Canada, the series was simulcast on the Global Television Network throughout its original run. In Australia, the series has previously aired on the Nine Network and is currently airing on 7Two. In the UK the show aired on BBC Two and in Ireland on RTÉ One. In Indonesia, it was aired by RCTI. In Italy the series arrived in 1989 and first season was aired by Telemontecarlo. Then it was aired by Italia 1, from 1992 to 1993. 1 2 J. O'Connor, John (November 2, 1988). "Review/Television; 'Head of the Class' Goes to Moscow". The New York Times. 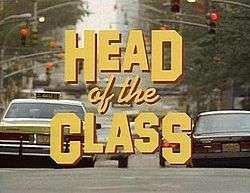 ↑ "Head of the Class". The New York Times. ↑ "BBC - Comedy Guide - Head of the Class". Web.archive.org. Archived from the original on April 8, 2005. Retrieved 2015-07-26.